The Dallas Stars, while keeping an eye on the present, looked towards the future as well on Thursday, trading 27-year-old defenseman Nicklas Grossman to Philadelphia in exchange for two draft picks, a second-rounder in 2012 and a third-rounder in 2013. It was a good return for a blueliner who was slated to become an unrestricted free agent this coming summer and wasn’t likely to re-sign here. General Manager Joe Nieuwendyk indicated that in addition to wanting to get something in return for a guy who was likely to walk away for nothing in July, the deal was also made to give other players on the roster, and within the organization, more chances to earn ice time going forward. At 6-foot-2, 233 pounds, Fistric is a valuable physical presence who had been squeezed out of the lineup a bit lately, sitting out as a healthy scratch for five of the previous 10 games, while Pardy hadn’t suited up since Jan. 10, a span of 15 games, even heading down to AHL Texas last week on a two-game ‘conditioning stint.’ Meanwhile, the club has a pretty well-stocked group of defense prospects coming in the next couple of seasons as well, so the future should be well-covered. Nieuwendyk did acknowledge that the club had not really engaged in any substantive contract discussions with Grossman or his agent, and with the recent decline in Grossman’s performance, which saw him register a -7 plus/minus rating over his last 12 games for Dallas, opted to go in a different direction. Apparently, several teams had inquired about Grossman’s availability, and Nieuwendyk liked the Flyers’ offer the best. The 6-foot-4, 230-pound Grossman was in his fifth season with the Stars and had skated in 52 games this season, leading the club with 100 blocked shots, while recording five assists and an overall plus/minus of 0. 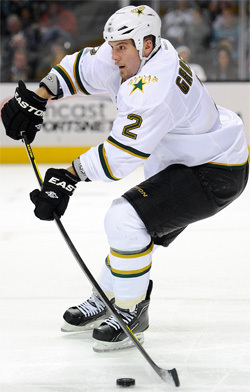 Dallas’ second round selection, 56th overall, in 2004, Grossman played one year in the Swedish Elite League before coming over to join the Stars’ previous AHL affiliate in Iowa in 2005-06 and has been a valued member of the organization since. With the trade deadline just 11 days away and the Stars in the midst of a mini-slump, having gone 1-3-1 in the five games prior to the deal that left them 11th in the Western Conference standings, there were questions about whether the trade signaled that Dallas would be sellers instead of buyers, but Nieuwendyk denied that notion. As for the draft picks, receiving a second-rounder in the 2012 Entry Draft was a big part of the deal as the club continues to build for the future. The selection is actually Los Angeles’ pick and counting the Stars own selections, should give Dallas three choices in the top 50 of a draft that looks to be a deep one.